Hi everyone, the freebie this week is a card base for you to decorate with embellishments of your choice so it's quite versatile. I just added as simple printed topper which I found on a free Craft CD. I'm finally getting back in to doing some new designs after getting my new PC - took me a while to get everything up and running but I think I'm there now. Hope you like the card and have a nice weekend. Awesome design Shirley, love the die cut out. Love the concentric scallops. What a versatile design! Thank you! You have some lovely designs and are very generous to share them. 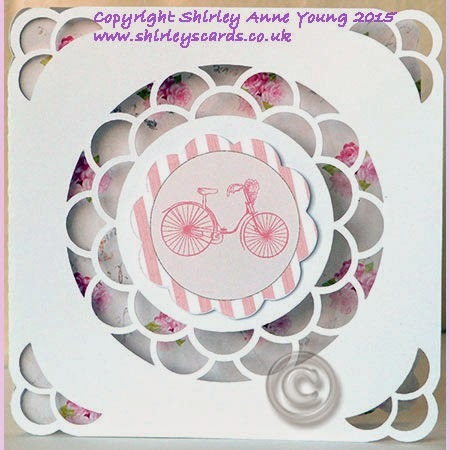 Gorgeous card, Shirley!! You are so talented and creative. Thank you for sharing your lovely card and file. Another beautiful card Bird! Great job. Thanks for the card. I just did some shopping, too! Lovely card with a great deal of versatility. Thanks for sharing. Thank you. This is a great design. This is lovely Shirley my granddaughter has just sorted my computer out for me as was having terrible trouble with pop ups on the new one but Ive changed to Norton and so far so good. SO very pretty Shirley, I love the corners too. I'm so glad you have your 'puter back and working as you want. Even though it does take a while to get used to it. thank you. Such a useful file. Just a Beautiful Card. Thank you. Quite a lovely card! I am from Massachusetts in the United States. Nice and versatile, thank you. What a wonderful design. Thanks so much! Thanks I'llfind lots of ways to use such a useful base.